Inquiry–Dare to question and embrace the search! Inquiry is the driving force in a writing workshop classroom. Students and teachers, alike, use questions and questioning strategies to become active learners and participants in the community. Whether we are writers, readers, researchers, digital citizens, the impetus of our collective and individual learning is curiosity. When was the last time your students were truly curious? If they are like mine, my students tell me that they stopped feeling curious about what they learn in upper elementary school as they moved into content specific classrooms and faced looming standardized tests. Young children learn about the world around them by asking questions, being curious, and exploring. 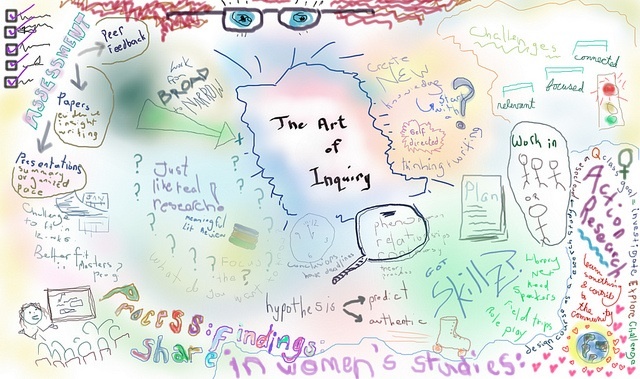 Many of us can quickly paint a picture of how inquiry works in the context of research. I-Search projects and social action research have become more and more prevalent. But, inquiry doesn’t just live in the context of research; its pulse frames all learning in the workshop community. Looking to rekindle that curious spirit? Try these steps to tap into that natural curiosity in relation to your beliefs about student writing. Then, go one step further and try this strategy with your students! What are your beliefs about student writing? What absolutes, values, norms, and principles do you hold near and dear when it comes to facilitating a writing community with your students? I invite you to spend a few moments writing about what you believe, in whatever format works best for you. How do you know this to be true? Take a couple of minutes thinking about how you have come to hold those beliefs. Are there stories or students from your own classrooms that have led you to forming these beliefs? Do you have professional mentors, authors, and teachers who have guided you in understanding these beliefs? What research, facts, theories, etc all demonstrate your belief to be true? So what do I wonder? Give yourself five, ten, even fifteen minutes to just brainstorm questions. What do you wonder about your students as writers or the writing community you share with them? Write as many questions as you can think of. Share your questions with a peer or even your students. Ask them to show you which questions they feel most curious about. Do they have any questions they could add to the list to expand or narrow your questions? Take a minute to consider the questions your peers marked as most interesting and any new questions they might have added. Do you see a pattern? Is there a question that seems to stand out more in your mind? Is it possible to write a new question that encompasses these questions? What happens now that you’ve formed your own burning question? Is there a resource or strategy that you might integrate into your classroom to strengthen the writing community? Can you find a network of professionals and teachers to reach out to in order to further explore your question? What ways could you engage your students in exploring the question…or better yet, in creating their own questions. 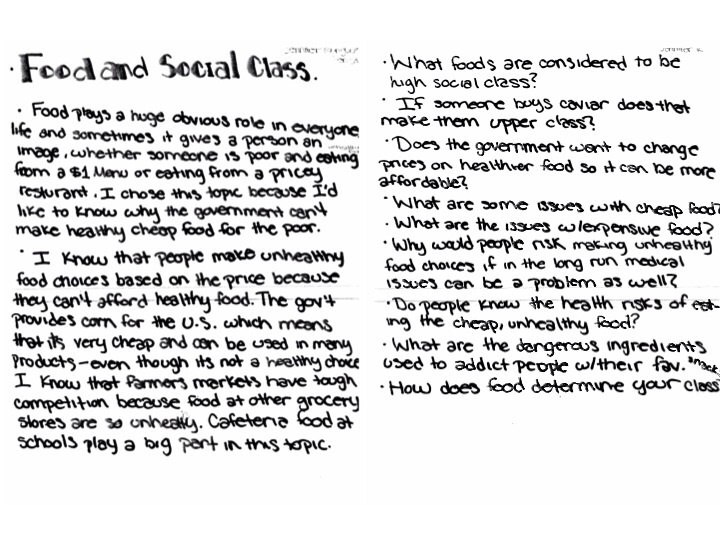 Student uses Ballenger’s strategy as they move from “exploring” to “questioning” in the inquiry cycle. This strategy lends itself well to research, of course. But, what I found is that this strategy became much, much more for our community than just a springboard into research. We began to utilize the same process to respond to what we read, respond to one another’s writing, and even develop new norms, policies, and community “rules.” When our we adopted curious minds and allowed ourselves the freedom to “wonder,” that’s when magic started. What adaptations and applications can you imagine for this strategy? What is your burning question? How could you use this process to engage your campus or department in considering their individual and collective beliefs in order to transform instruction? This post accompanies the presentation Writing Teachers (Re)Inventing Literacy Instruction by Following the North Star for NCTE 2013 in Boston, MA–Please message me for more information regarding this session or visit the North Star of Texas Writing Project’s Facebook page. This entry was posted in Uncategorized and tagged community, student writing, writing community.